Darn it! Is that Psy? I think this is the worst I've seen him dressed. I mean.. check out that auntie's blouse he's wearing. Seriously? 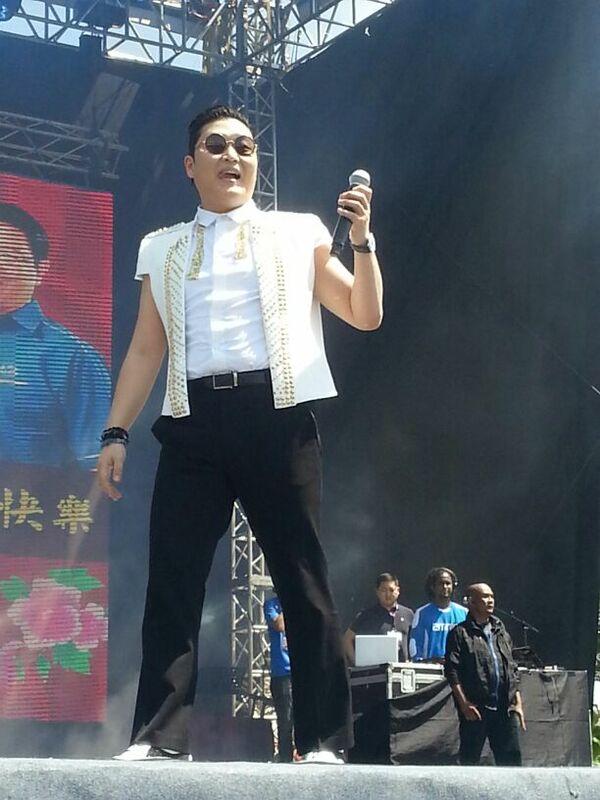 This was one of the pics of Psy flying around from the controversial Penang show. 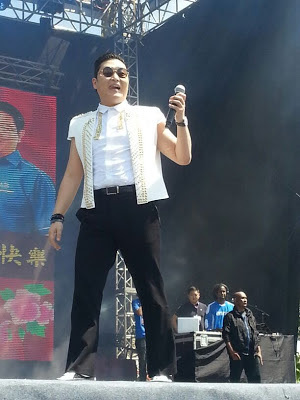 I think Psy is pretty amazing, but like many people - I'm turned off by his visit here for the Barisan Nasional open house - not because of political reasons, but because of the sheer obscenity of paying him that much for one damn song. Malaysian artistes are so badly treated in comparison. What Psy got for ONE song, any local act would kill for even 1% of that for a half hour show. Still business is business, and I guess Psy just wanted to cash in irregardless of who was the host of the show as long as he hears the ringing of the ka-ching! Since I am part Penangite (Pulau Tikus yo!) I was proud earlier this afternoon when this video went viral! Watch it! Worth a laugh! Oh yes... that did just happen! Ye aku bangga jadi anak Pulau Mutiara!!! (well, the part of me that is, is). Tapi as usual, cybertroopers start la aktiviti bashing. Alasan paling kerap dengar, "oh... kurang ajar, so rude... tak reti balas budi... tak reti bersyukur". Hey twats. Those people in government office - answer to the people. Since when do the people have to kowtow to the likes of the government? Dah jilat sampai melecet hingga lupa ke hak rakyat? Lom ada lagi kata.. ala that section of audience saja... erm... show me a video of people actually saying YES to the second question and then we'll debate that. Otherwise, your whole existence has immediate been rendered invalid for the sheer stupidity of your random comments. I don't know about you guys... but I know I had a good laugh. I hope the message goes out loud and clear. People were asking for local artistes... not a reason to splurge and waste money when we keep getting told that we have to be more thrift as times are tough.